Today you’re going to learn how to use one of the fastest growing social platforms, Instagram Stories, to build your email list. Without using the Swipe Up feature. I don’t know about you, but Instagram has become my favourite social media platform. That’s mainly because I love Instagram Stories, but also because I think the connections on Instagram feel more real than any other social platform. If you’re on Instagram, you’ve probably either recorded an Instagram story yourself, or viewed one (or several). Let’s face it, they’re completely addictive. Or maybe you’ve heard someone else talk about Instagram Stories and you weren’t really sure what the heck they were talking about. Wherever you fall in this equation, there’s one thing that is certain…you as a blogger or business owner, should be using Instagram Stories to create more solid, real connections that will, if you do it right, go far beyond just chatting on social media. 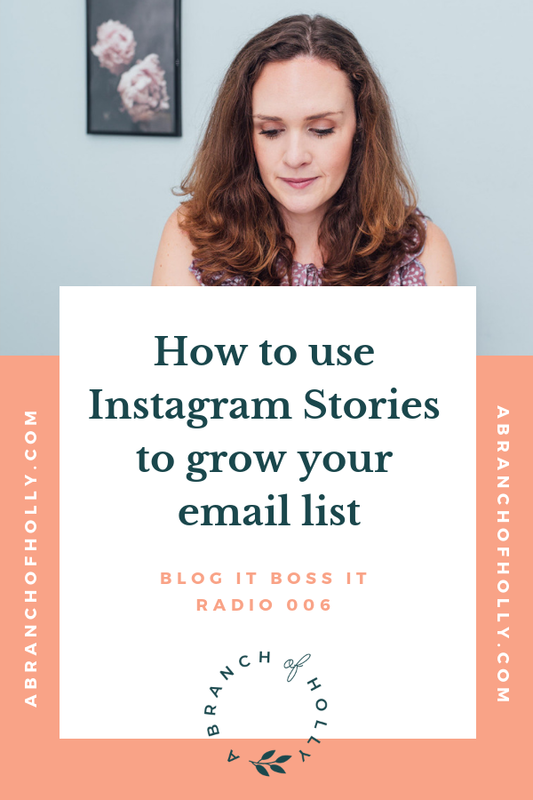 Myself and my clients have found great success in growing an email list through Instagram Stories. In this episode, I’m sharing loads of valuable insight, tips, and strategies that you will be able to implement starting today. And don’t worry. As I mentioned earlier, this strategy has nothing to do with the Swipe Up feature, which requires you to have 10,000 followers to use. So whether you’re familiar with Instagram Stories or not, I’ve got you covered! Let’s first dive into the basics around Instagram Stories and then we’ll go ALL in on strategies to grow your email list via this platform! WHAT IS AN INSTAGRAM STORY? An Instagram Story is content that is shared on Instagram itself, typically photos and videos, but you can also share text-based images. Your photos or graphics last six seconds while your videos can be up to 15 seconds long. You create the Story content using Instagram (the creation and editing tools are built right in), or you can create them externally and upload them to your Instagram account. Stories are different than a post in your regular Instagram feed because the content goes away after 24 hours unless you add it as an Instagram Story highlight in your profile, which is a whole different episode! Instagram now has over 1 billion users. Of those, 500 million are on the app every day. And of those 500 million, 300 million are on Instagram Stories every day. Need I say more? Instagram Stories are taking over as the content of choice, and Instagram likes this, because it gives them another place to run ads. And as bloggers and business owners, Instagram ads are a very powerful tool as well. Never let the dashes turn into dots. The way I say this is in regards to being careful to not create painfully long Stories. I talk about how some people have AMAZING light for their Stories and I share two tips that money can’t buy. Use captioning in your Stories for people who want to consume your content but don’t use audio. This technique will help keep retention high, too. Drive interaction with Instagram features like polls and DM conversations. Engage with your followers. Utilise a beginning, middle, and an end to your Story. Just like your school teacher taught you! Download this great worksheet “The Story Art Method” to work through an exercise I put together for you to up your Instagram Story game. Now that you have a plan to create high quality Instagram Stories, I also share some really great insights as to how to grow your email list through a Direct Messaging strategy. I explain that even if I did have 10,000 followers and was able to use the Swipe Up feature available in Stories, I wouldn’t use it much because it’s a bit lazy and too passive. It’s through this DMing that you can directly communicate with your followers, build relationships, hear pain points directly from your potential customer or reader’s mouth, and engage in an authentic way. Do these things and the opt-in opportunities that you offer your followers (the ones that keep coming back to watch your Stories) will put you in a prime position to grow your email list. The only problem is that it can be time-consuming. Time well spent, but time-consuming, nonetheless. If you get a lot of DMs and wonder how to manage it all, one of the top tips I share is to get in there a few times throughout the day so you are responding pretty quickly. This also makes sure the DMs don’t pile up and become too overwhelming for you to respond to. I’ve found that it’s helpful for me to actually create a task in Google Calendar to check my DMs daily, and that’s working well at this point. So here’s what I want you to do, download and work through this worksheet that I created for you and don’t spend another minute on Instagram without intention and purpose. My monthly membership launching next year, Blog It Boss It Academy. If you are struggling to grow your online presence or if you’re at a standstill and you’re sick of throwing spaghetti at the wall hoping a strategy will stick, this is the resource for you. Register your details below! We know there are a LOT of podcasts you could be listening to today, but you chose this one and I’ll be forever grateful for that.